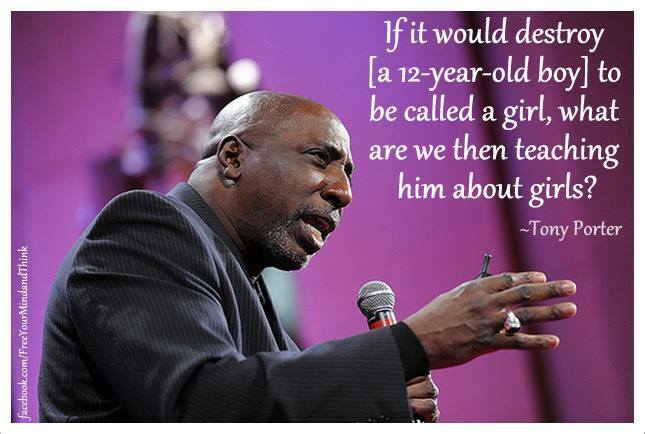 This quote is from an excellent TED talk by Tony Porter, an educator and activist who is internationally recognized for his efforts to end violence against women. In his talk, “A Call to Men,” Porter explores the social conditioning that he refers to as the “man box,” which can lead men to disrespect, mistreat, and abuse women and each other. For Mighty Girl books for teen readers (13+) that address issues of abuse and violence and offer a helpful way to spark conversations around this important topic, we recommend “A Step From Heaven” (http://www.amightygirl.com/a-step-from-heaven), “Speak” (http://www.amightygirl.com/speak), “I Hadn’t Meant to Tell You This” (http://www.amightygirl.com/i-hadn-t-meant-to-tell-you-this), and “If You Find Me” (http://www.amightygirl.com/if-you-find-me).